Another Wet Week Ahead With An Increased Risk For Heavy Rains & Flash Flooding. Photo Is Courtesy Of My Wife. Get ready for another round of thunderstorms which will likely produce heavy rains along with an increasing risk for flash flooding, and perhaps a few severe thunderstorms this week. A few thunderstorms will pop up over southeastern New Mexico and nearby areas this afternoon and will increase in coverage and intensity Tuesday into Thursday. 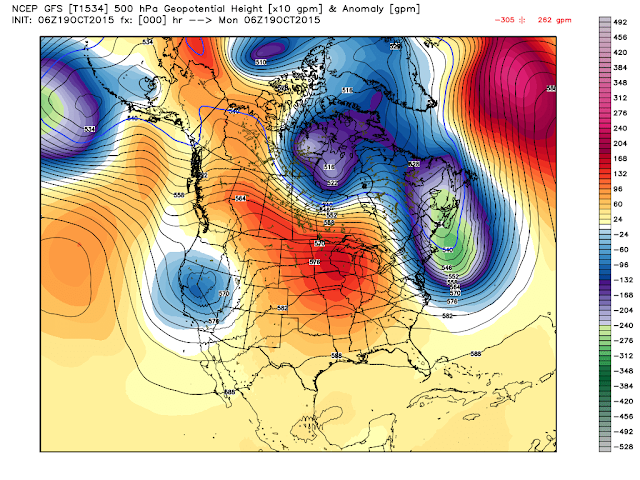 Cutoff 500 MB Low To Set Up Camp Near Us This Week. GFS 500 MB Low @ Midnight Last Night. GFS 500 MB Low Forecast. 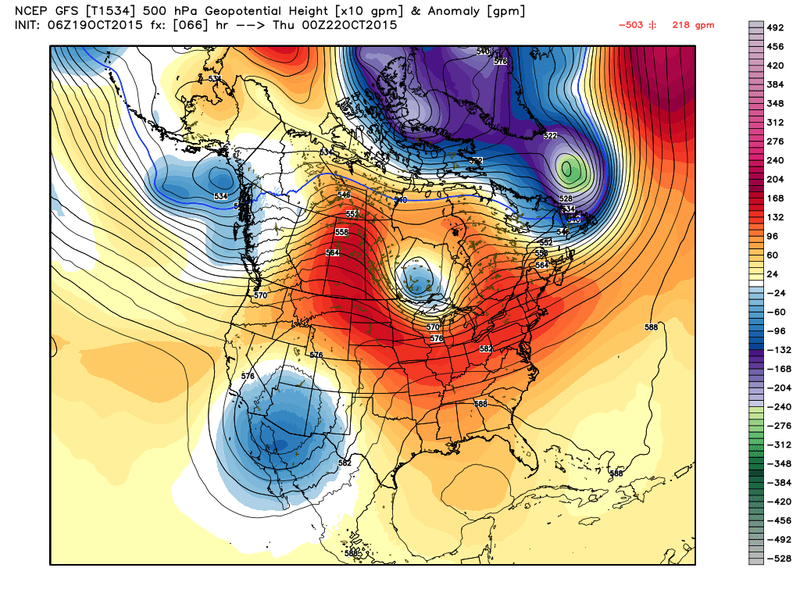 Valid @ 6 PM MDT Wednesday, Oct 21, 2015. Heavy Rain & Flash Flooding Threat Increasing. Several days ago the computer forecast models were going nuts with their forecasts for the local area with excessive rainfall totals by the end of this week. How much is excessive? They were painting anywhere from 2" to 14" over the southeastern and eastern New Mexico plains . They have since backed way off on these totals. Why? For one thats what the models do. A week or so out ahead of an event they usually are not that reliable and this was the case this time also. Second they were thinking that a tropical storm could develop in the Gulf of Mexico and move northward impacting the northern Gulf areas area anywhere from Brownsville to Louisiana. Now they have discounted this possibility. 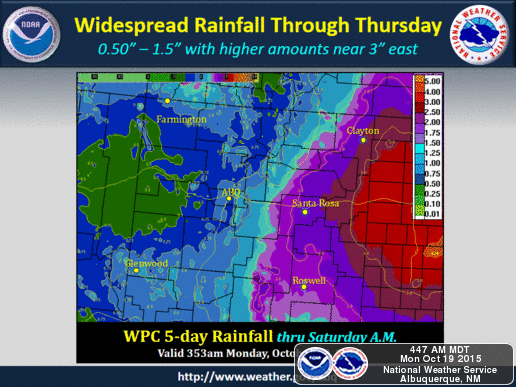 Therefore they have come way down with their storm total rainfall amounts by the end of the week. We are not out of the woods though. A cutoff mid-upper level low located near Reno, Nevada at midnight last night is forecast to continue digging or dropping to the south and southeast today into the middle of the week. There are questions as to how far south it will dig and how long it will linger over or near the area. 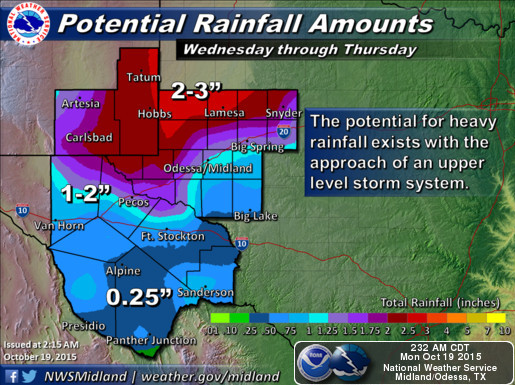 Which of course will help determine just how much rain falls this week and where the heaviest rains will fall. A few thunderstorms will pop up this afternoon and evening. An increase in storms is forecast Tuesday into Thursday as the upper level storm approaches from the west. A cold front will work its way into the area on Tuesday providing good low level moist upslope flow from the Gulf of Mexico. Abundant mid-upper level sub tropical moisture will also be streaming northward into the area from Mexico and the eastern Pacific Ocean which will add fuel to the fire and help with the setup for a heavy rain event that will last several days. Favorable lift, instability, and wind shear aloft will also cause a few severe thunderstorms to possibly break out Tuesday and Wednesday. A Flash Flood Watch may be issued by our local National Weather Service Offices for much of the local area Tuesday or Wednesday. The models still do not have a really good handle on just how much rain will fall this week. Current indications are that the local area may see anywhere from 1" to 4" or more by Friday. This is subject to change and may actually go up in some areas and down in a few others.